The ankle joint, or talocrural joint is formed where the foot and leg meet, connecting the tibia, fibula, and talus. This joint allows the foot to move up and down or side to side. The calcaneus is the largest bone in the foot, and it lies under the talus, with which it forms the subtalar joint, which works in conjunction with the ankle joint to allow triplane motion of the foot. The talus works inside a socket, acting as a director to the movements of the ankle. To see how your talus controls the movements of your ankle, try this experiment: While keeping your heel on the ground, lift your toes and hold them up. This movement is called dorsiflexion. You will also note that your foot can be moved from side to side. Now place your foot on the ground and lift your heel up while keeping your toes on the ground,. This movement is called plantarflexion. Although the foot is perfectly capable of moving numerous ways, most of its flexibility is due to the presence of other joints within the ankle region. The ankle joint acts as a hinge joint, limiting the rotation of the talus. This makes the ankle one of the most stable joints in the lower extremities. 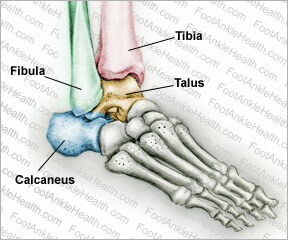 The talus is also known as the ankle bone and is found underneath the tibia and fibula. The parts of the bone that move against each other have articular surfaces which form the ankle joint. Each is covered in a smooth hyaline cartilage and held together by strong ligaments: the lateral side is held together by the anterior talofibular ligament, the calcaneofibular ligament, and the posterior talofibular ligament. Inside of the lateral malleolus: This is the lower end of the fibula, and it moves against the outer side of the upper surface of the talus. This is the bone that sticks out on the outside of your ankle. You can easily see and feel it. Undersurface of the lower end of the tibia: This surface moves against the talus and forms the roof of the socket. Inside of the medial malleolus: This is located at the lower end of the tibia, and it moves against the inner side of the upper surface of the talus. This is the bone that sticks out on the inside of your ankle. You can easily see and feel it. Dome of the talus: This is the upper part of the talus, and it fits into the ankle joint and moves against the lower ends of the tibia and fibula. The stability of your ankle joint heavily depends on the ability of these ligaments to keep the talus bone (or central bone) in place while the ankle is moving back and forth. Your ankle joint is more stable while your foot is flat on the ground. It is more susceptible to injury when your foot is pointed down (plantarflexed) with the talus moving out of the ankle mortise. When it is enlarged, it becomes dependent on the soft tissues and ligaments to support, protect, and stabilize it. Ligaments and soft tissues are softer than your bones, making them vulnerable to injury when your foot and toes are pointed down. Injuries to the ankle usually take the form of fractures, strains, or sprains. Ankle fractures are very common and can range in severity from less serious avulsion injuries to severe breaks of the tibia or fibula. In most cases only the tibia or fibula are injured. Rarely is the calcaneus or talus fractured. Most ankle injuries are caused by the ankle rolling inward or outward. Injuries such as strains and sprains affect the muscles, tendons, and ligaments, not the bones of the ankle. These injuries are also very common and are sometimes associated with ankle fractures, but usually occur on their own. Broken ankle bones can vary in severity—sometimes they are merely a few cracks in the bone; other times pieces of the bone protrude through the skin.